They say you can’t teach an old dog new tricks. I have no idea if that’s true, but I can say for sure that a new dog can teach an old guy a thing or two. I’m referring to myself, but I’d offer that advice to our president. Trump has a habit of using canine insults. His most recent one, in which he called his reality show protege, Omarosa, “that dog,” caused such an uproar it got me thinking about my own evolving relationship with man’s best friend. Growing up, I never had a dog. For a while, we had a cat, imaginatively named Kitty. She was an indoor-outdoor cat. By that, I mean we “trained” her to go outside to do her business. It was the 1960s. About that same time, with the arrival of synthetic fibers, companies started marketing indoor-outdoor carpet. If you can recall what the stuff looked like then, and if you ever owned a cat, you probably share my opinion. Cats and carpets should be one or the other. Trying to have it both ways stinks. I don’t recall my parents being anti-dog, but they certainly weren’t “dog people.” And they weren’t really “cat people,” either. Kitty was an interloper, tolerated to appease the kids. Later, while raising our two children, we got a cat. I suppose I considered myself a cat person, since that’s what I’d had. My wife, although raised with dog, was fine with it. One day, she and my daughter brought home a second cat. I became an appeaser. Some of my friends owned dogs, but one thing I now realize is that occasionally petting other people’s dogs tells you nothing about what it’s like living with one. In January, our son moved from out-of-state to a branch office of his company near our home. We relocated here ourselves to be near our daughter and son-in-law, so we’re thrilled to have everyone together. Everyone includes his dog, Ernie. And because our son travels a lot for work, we now have a part-time dog at our house. You may ask why I only have hyphenated pets. I don’t know, but a part-time dog beats an indoor-outdoor cat. And part-time is perfect for our empty nest. Ernie is a rescue dog of dubious heritage. He’s way bigger than a dachshund but long and low in the same way. The first time I saw him, I thought of those stretch SUVs that have joined luxury sedans for chauffeured parties on wheels. 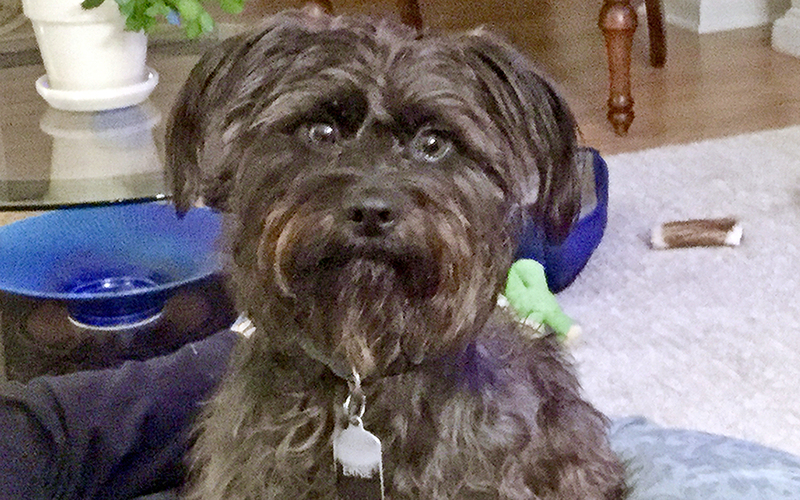 His dark curly coat and the shape of his head and ears suggest there’s some schnauzer in his past. I know little about dog breeds, and could care less about Ernie’s past, except that something instilled in him deep separation anxieties. Ernie chewed and clawed the door framing at my son’s prior apartment whenever he left. Luckily, a developer bought the place to tear down and replace the building when his lease ended. We were worried about how Ernie would behave alone in our new house, but since I work from home, he rarely is. My wife is his primary caregiver when he’s with us. Whenever she goes out for several hours, we have a routine. She gives him a chew treat. He enjoys it until hearing the garage door. He howls twice, a long one followed by a short one that’s a bit different. I don’t know what he’s saying, but I know what he means. Reminds me of Chewbacca. After a few minutes of whimpering, Ernie settles down and curls up on a fluffy rug by the door. When I come downstairs for lunch, he sometimes gets up to engage with me, but eventually, he’s back to his spot—dutifully awaiting her return. When that comes, he’s rapturous. Surprisingly, when I went out of town for the day, and my wife stayed home, he reacted the same way when I left. And when I returned. I hadn’t realized he cared. Cats have their virtues, but caring is not one of them. People bond with dogs perhaps because the unconditional love dogs exude comes with the need and responsibility to care for them in ways that cats don’t require. Feeding, walking, grooming, and playing occupy much more time and build shared experiences. When we walk Ernie, his short legs go into overdrive when the pace quickens. He tucks his ears back in a way that suggests he’s the patrol leader. When he glances back up at me, tongue hanging, he doesn’t even need to bark. I know his question: Isn’t this the most fun ever? Yes, because dogs live in the moment, and being with them allows us to, as well. Now, when we’ve been apart for a week or so, I get an added bonus. Ernie comes scampering toward me with a look that could melt all but the stoniest of hearts. I realize that some cultures eat dogs and others honor cows, but Americans, for the most part love dogs. To our American president, I say, please spend some time with good dogs and less time with bad people. And stop using dog insults to attack humans. It’s not fair to dogs.